Wondershare says that their Streaming Audio Recorder software can record audio from practically any online stream -- including from video sources too like YouTube. With added features such as a ringtone maker, automatic music tagging, ad-removal, task scheduling, and the ability to push recordings into your iTunes library, is this the app you should choose for capturing audio from the Web? To see if Wondershare Streaming Audio Recorder (WSAR) lives up to the hype and is worth investing in, read this full review that cuts to the bone. 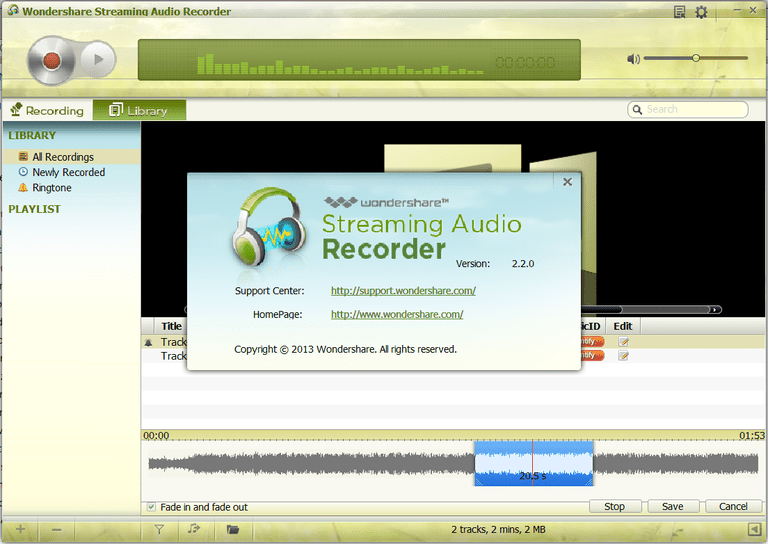 One of the joys of using Wondershare Streaming Audio Recorder (WSAR) is the simplicity of the interface. It's extremely easy to use and you'll find that you can dive straight in after installation. The program makes it very easy to set up a recording session without having to learn its features first. In fact, there's only one button you'll need to get going -- the big red record button. As well as the intuitive interface, the overall look of the program is graphically appealing too with a nice blend of colors which makes using it easy on the eyes. The main interface consists of just two menu tabs near the top of the screen. The first one is the recording menu which gives you a real-time view of the recording process and a historical list of tracks that have been recently captured. There's also access to the scheduler which is a great feature if you want to record a radio show for example at a set time. The library menu tab gives you a view of all the recorded audio and any playlists or ringtones you have created. There's also convenient access to other built-in options too like an ad remover, search box and a send to iTunes facility. Overall we found that the interface of WSAR was super-easy to use. We especially liked the fact that the record button is conveniently located and can be accessed at any time. This makes the program very user-friendly so you can get on with recording streaming audio from the internet with minimum fuss. Software developers and Wondershare say that WSAR can record audio from virtually any online stream, but just how good is it? To put the software program through its paces we chose a mix of sources to see how it fared. One of the most popular ways of enjoying digital music is, of course, using a streaming music service. To test the flexibility of the program and the quality of the captured audio we chose a selection of popular streaming music services. The first one to be tested was Spotify. We used the service's Web player and streamed a selection of tracks. WSAR automatically recorded each song and correctly identified it when the track finished playing. Audio quality was good with streams recorded as MP3s at the default bitrate of 128 Kbps. Not to restrict itself, WSAR also has the ability to record the sound from video streams too. This can be an extremely useful tool to have when you don't want to hog space on your portable when just the song is needed. We tested the video to audio recording abilities of WSAR on popular sites that have music videos. This covered YouTube, Vimeo, Vevo, and a few others. Just like recording from music-only services, WSAR was able to effortless record the audio from each music video we streamed to produce an MP3 which was correctly tagged too. As well as taking a look at the recording capabilities of WSAR we also looked under the hood to see what kinds of tools the program provided for managing the captured audio. If you use a free account on music services such as Spotify, then you've no doubt heard the short advertisements that play every once in a while. Built into WSAR is a tool that aims to sniff out these pesky ads which also get recorded during a streaming session. It works by looking for recordings that are much shorter than a typical song. By default, this is set at 30 seconds or below, but this value can be changed. We tried this option and successfully removed all the ads that had accumulated during our tests. This is a great time-saving feature that undoubtedly makes recording audio from ad-supported services even better. To make it easy to turn the recordings you have made into sounds for your phone there's also a built-in ringtone maker. Normally you would have to use an audio editor or mP3 splitter to do this, but clicking on the bell icon next to a song brings up the built-in ringtone maker. We tested this feature out by selecting a few recordings and it worked very well -- it gives you the option to choose the length of the ringtone and the exact part of the song you want to sample. When it comes to saving your ringtone you also get the choice of either .M4R (compatible with the iPhone) or a standard MP3 which can be used on the majority of phones that use realtones. Another neat option in WSAR is being able to populate your iTunes library (if you have one) by using the Add to iTunes tool. You can choose either a single track or a block of songs to transfer. Interestingly, we also noticed that this tool is also found in the ringtone maker when you click save. A nice option to easily populate your iTunes library. This feature may not be groundbreaking, but it's still a useful option that deserves a mention. As well as being great for organizing your recorded streams, we also found that you can add them to your iTunes library too. If you use playlists in iTunes, then this is another useful feature. By default, WSAR encodes audio in the MP3 format at a bitrate of 128 Kbps. This is probably acceptable for the average recording, but if you're listening to a stream a lot higher than this then you'll want to change it so you don't lose audio quality. This is easily changed in WSAR's settings, but we noticed that it doesn't go up to the full 320 Kbps -- only a maximum of 256 Kbps. Some streaming music services deliver songs in high quality 320 Kbps so you won't be able to get the same quality (in this scenario) in a recording. Another shortfall we found is that the program only supports two formats -- namely MP3 or AAC. This is probably sufficient for general audio capture, but we'd like to see a few more options. If you listen to streamed music and want to record it for later playback, then it doesn't get much simpler than with Wondershare Streaming Audio Recorder (WSAR). Not only can you start recording straightaway after installation, but its intuitive interface also makes it easy to use all the built-in tools for managing your recordings. With tools such as a built-in ringtone maker, playlist creator, and advertisement remover, WSAR is a well-rounded program for recording Web streams. There's also a handy facility to add songs, ringtones, and playlists to your existing iTunes library. The quality of the recordings are first-rate. There were no dropouts in the streams we captured nor any audible degradation (compared to the original). During testing, we found that WSAR was able to detect and capture audio from all the streaming music services we tried and correctly identified the start and end of each track. Music tagging was also excellent using the Gracenote online database service to fill in the metadata. However, we were slightly disappointed to only see two encoders in WSAR's settings. It would be nice to see a few more options in this area to make the program a more flexible solution. We were also impressed with WSAR being able to capture audio from video streaming sites too. Video services like YouTube are a great resource for music discovery and it's certainly a bonus to be able to record audio from these too. Overall we found Wondershare Streaming Audio Recorder a reliable and useful tool that packs enough features to be a worthy addition to anyone's media software collection. Spotify: Is it Worth Subscribing to? Capturing Streaming Music: What Software Tools Do You Need? Tunebite: Is This the Best DRM Removal Tool for Your iTunes Songs? Playing Audio Files on the iPad: What Formats Are Supported?